Hermetic seals for temporary use. These clips can be used instead of a heat sealer. The clip is designed to seal a flat bags with three heat sealed sides. It is important to use these clips only within room temperature range. It is difficult to obtain a perfect hermetic seal with them at extremely high temperatures. 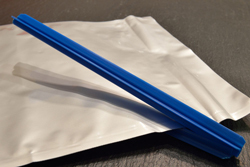 In addition, when the clips are used to seal a thin film bag after using it to seal a thick film bag, a complete seal may sometimes not be obtained. After separating the interlocked parts of the clip, press evenly to close them over the mouth of a high barrier film bag. To remove the clip detach the two parts at one end and pull apart. Do not attach the clip over foreign substances such as powder or the label of the bag. Avoid creasing the bag when sealing. Material: ABS, long-term stable and neutral. The clips can be custom made to any length, but in higher quantities only. Products on stock are usually sent out within one week. Nevertheless, please order as early as possible. Transport is normally by FedEx Economy (±2-3 days within Europe), carriage is charged according to weight, dimensions and number of parcels. All prices are exclusive VAT. Payments can be made within 30 days by bank transfer, within 14 days with 3% discount. All prices are subject to change without prior notice according to our terms and conditions. Check our website for actual information.